The collection impresses with its elegant, comfortable furniture. This classy ottoman combines relaxation with a timeless appearance. Beautiful exposed wood feet and seam accents give a touch of interest to this exquisite foot rest. Match with the chair or sofa for a complete look. Available in over 100 supple leathers. 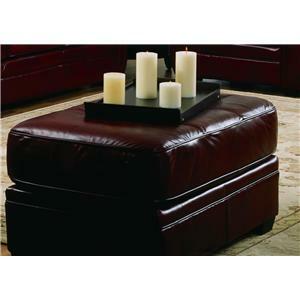 The Thompson 77792 Ottoman by Palliser is available in the area from furnishingretailers.com. The Thompson collection features traditional, casual living furniture. This elegant collection has rolled arms with detailing seams, plush stuffed pillow back, and sophisticated exposed wood feet. Functional sofa beds, or simple sofas, as well as deep, comfortable chairs, relaxing love seats, and a fine ottoman compose this delightful collection. With over 100 supple leathers and fabrics, matching your style couldn't be easier. The Thompson 77792 collection is a great option if you are looking for Traditional furniture in the area. Browse other items in the Thompson 77792 collection from furnishingretailers.com in the area.